Republican presidential candidate John McCain announced Tuesday he would order the federal government to spend $300 billion in federal funds to buy up bad home mortgages and allow financially troubled homeowners to keep their houses. McCain's proposal, which he announced during Tuesday's presidential debate, would use nearly half the $700 billion from the recent bailout package to assist Americans directly, instead of indirectly by rescuing the nation's financial markets. Democratic nominee Barack Obama last month sounded a similar theme, proposing that the government consider taking such a step. But McCain's approach was far more categorical. "I would order the secretary of the Treasury to immediately buy up the bad home-loan mortgages in America and renegotiate at the new value of those homes - at the diminished values of those homes and let people be able to make those payments and stay in their homes," he said. The proposal, which he called the American Homeownership Resurgence Plan, is as much a policy plan for the future as it is a political tactic for the present. The economy has been a key factor in helping Obama pull ahead of McCain nationally and in key battleground states. What's more, Americans reacted with helpless outrage at the need for a $700 billion rescue for the country's financial institutions. Many Republicans voted against the package, objecting to its size and to government intervention in the free market economy. McCain's step would represent an even greater role for government and potentially an even greater financial loss. McCain made clear he would use the plan to distinguish himself not only from his rival but also from President Bush, an increasingly unpopular figure as the economy sinks. "It's my proposal," McCain said. "It's not Sen. Obama's proposal. It's not President Bush's proposal." As conceived by Treasury Secretary Henry Paulson and as passed by Congress, the rescue package would be used primarily to purchase mortgage-backed securities. It would allow, but not require direct purchase of mortgages. Under McCain's plan, the Treasury would be required to rework mortgages directly with homeowners whose houses were losing value. It was unclear - either from McCain's remarks or from the backup materials provided by the campaign - how such a massive plan would be administered. Though McCain, a budget hawk and critic of rising federal spending, did concede one point. "Is it expensive? Yes," he said. Under the plan, the government would buy failing mortgages from homeowners and provide new fixed-rate mortgages. A background paper provided by the campaign said the plan "could be implemented quickly as a result of the authorities provided in the stabilization bill, the recent housing bill, and the U.S. government's conservatorship of Fannie Mae and Freddie Mac." It also said it could require Congress to raise the government's borrowing limit. The Treasury's current plans for the money, however, could be well under way by the time a new administration is sworn in next year, leaving fewer options for a new administration. During the congressional debate over the rescue package, liberal Democrats failed in an effort to give judges the power to modify mortgage terms for people who have filed for bankruptcy. They also were unable to get approval for part of any profits the government might receive to go to help people facing mortgage defaults. The bailout package gives the secretary of the Treasury great latitude to deal with financial markets and address the current credit crunch. Ostensibly, the department would have the authority to intervene directly and help homeowners. In fact, at a news conference on Sept. 24, Obama said, "we should consider giving the government the authority to purchase mortgages directly instead of simply purchasing mortgage-backed securities." Days later, in a news release, he said he would "encourage Treasury to study the option of buying individual mortgages like we did successfully in the 1930s." 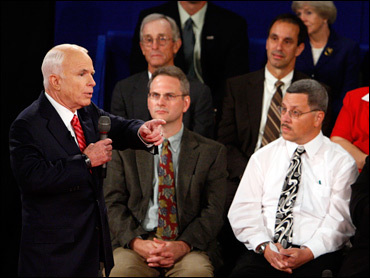 McCain has tried to portray himself as an activist in the midst of the financial crisis. He temporarily suspended his campaign to return to Washington and has depicted Obama as a more timid leader. "Until we stabilize home values in America, we're never going to start turning around and creating jobs and fixing our economy and we've got to get some trust and confidence back to America," McCain said.